At the Olympics, you might think that practice and skill are what determines who gets the gold. However, inconsistencies in the starting procedure of racing sports can randomly disadvantage some athletes. Due to the alerting effect, the longer the referee waits between saying “Ready?” and firing the starting pistol, the slower athletes will be able to respond to the starting shot. This might seem trivial, but we show that it can explain an unexpectedly large amount of variance in the 2010 Winter Olympic’s 500 meter sprint event. Here, one second of extra delay can mean 700 milliseconds of extra race time: Enough to mean the difference between first and fifth! We propose a change that would greatly improve racing sport fairness, which currently suffers from an injustice that disadvantages not only athletes, but entire nations rooting for them. You can read the full article here, and a summary is provided below. A typical racing sport involves the referee alerting athletes of the imminent start (“Ready?“), followed by them sounding the starting gun. The time that passes between these events is what we refer to as the ready-start interval, and it is variable. In running (rule 111-8 from UK Athletics) and swimming (rule SW 4.1 from the Fédération Internationale de Natation), the interval depends on how long athletes take to assume position. In speed skating (rule E-255 from the International Skating Union), a random interval between 1 and 1.5 seconds is added to that. In practice, this means there will be around 3.5 to 5.5 seconds between the referee’s “Ready” and the starting shot. In running and swimming competitions, athletes compete in different heats. In each of those heats, a different ready-start interval will be used. In speed skating competitions, athletes race in pairs, and each pair starts with a different ready-start interval. When all athletes have raced, their times are compared, and the skater with the lowest total time wins. It is very important to realise that this means that every skater starts with different ready-start intervals! Why should we care about how much time there is between “Ready” and start? Well, there is this thing called alerting. If you hear or see a cue that signals an event is about to happen, you will be temporarily alerted. This means that you will be quicker and more accurate to respond when said event actually happens. Now for the crucial bit: there is an optimal interval between the alerting cue and an event. If they are 500 milliseconds (half a second) apart, you will be at your quickest. The longer the interval between cue and event, the slower you will be to respond. Remember how each heat in swimming and running, and each pair of skaters started with a different ready-start interval? Due to alerting, this means that athletes starting with a long ready-start interval will be disadvantaged compared to athletes starting with a short ready-start interval. Importantly, which athletes are disadvantaged is entirely random! Until now, this has all been theoretical. Based on psychological research into alerting, you would expect some athletes are disadvantaged, but you would also expect that athletes’ training and skills are way more important for their performance. That’s why we decided to actually test our ideas by looking at the 2010 Winter Olympics’ 500 meter speed skating event. So I spent a few weekends going over the entire mens’ and womens’ events. From the official footage, I took the audio stream. By carefully analysing this in sound software, I could extract the time at which the referee started saying “Ready”, and at which he started to fire his pistol. The difference between these is the ready-start interval. Getting the official finishing times for all races was less of an effort, as those are published online. After collecting the data, I checked whether the ready-start intervals could predict the race time. Turns out they can, for a bit! 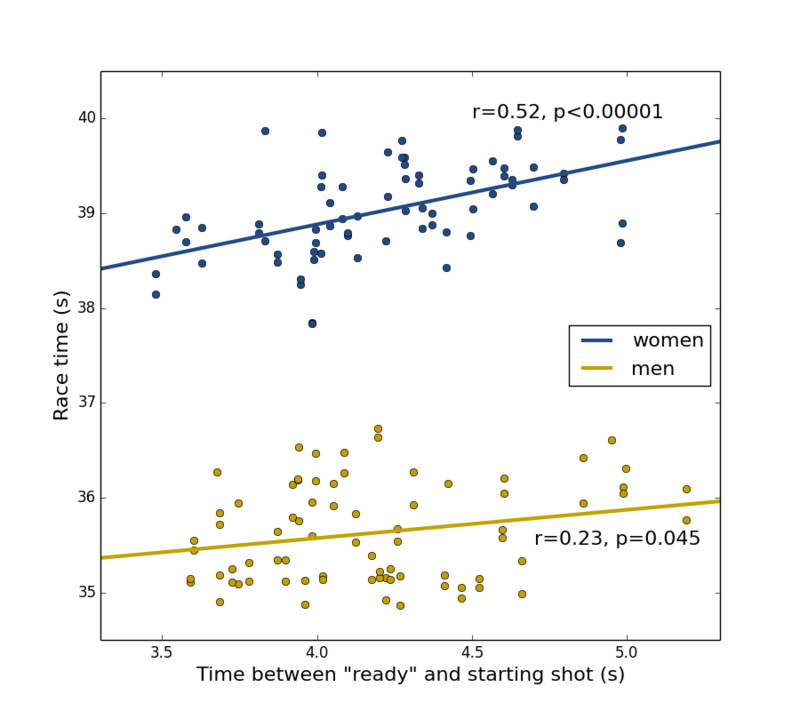 In men, the ready-start interval can explain about 5% of the variance in finishing times, and in women it’s a whopping 27%! (Note: that should have been 0%, if the competition was fair.) On average, having an additional second of ready-start interval made athletes 300 (for men) or 700 (for women) milliseconds slower on the whole race. That might not sound like much, but in speed skating that’s the difference between first and fifth place! The longer a referee waits between “Ready” and “Start”, the later athletes finish! What’s currently causing an issue, is the variability of the ready-start interval. Once you take out that, you remove the difference in alerting that gives some athletes an unfair disadvantage. One way in which this variability could be removed, is by introducing an extra step to the starting procedure. Ideally, the referee would ask athletes to go to the start (“Go to the start“), and would then ask them to assume their starting positions (“Get set“). When starting positions have been assumed, the referee should be able to press a button to activate a computerised start. This would signal the athletes to get ready (“Ready“), wait for a fixed amount of time, and then fire the starting shot. The procedure outlined here would remove any random alerting differences between races, and would thus remove the current bias against athletes starting with longer ready-start intervals. In racing sports, athletes compete against each other to in different heats to determine who wins the gold, or who advances to the next round. Each race starts with a different interval between the referee’s “Ready” cue and the starting shot. The length of this interval directly affects an athletes alertness: The longer the ready-start interval, the slower an athlete can respond to the starting short. We demonstrate that this is not just a theoretical issue, by showing ready-start intervals are correlated with finishing times in speed skating. On average, an extra second of ready-start interval will result in half a second of extra racing time. That could mean the difference between first and fifth place! An easy solution would be to remove the current variability in ready-start intervals, and improve racing sport fairness.